Finally it’s done! The new website of DE SANGOSSE is online! 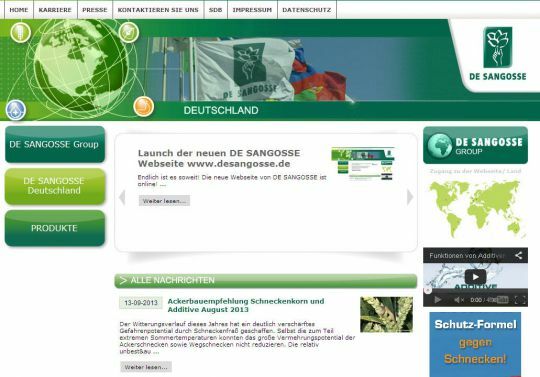 The heart of www.desangosse.de is the clearly menu navigation for a better and faster access to our products in the field of molluscicides, plant nutrition, adjuvants and plant protection. Background details and videos are explaining complex issues like the way of water softening with X-CHANGE easily and understandable. Contact persons, safety data sheets, press information, specifications to the current slug pressure and a brief company presentation of DE SANGOSSE are reachable with only a few clicks. The new website offers a lot of interesting information, pictures and facts about agriculture – a must for every farmer!